Some foam to protect the TM16GT. In the box there is a lanyard, spare o-ring and the manual. The weight I measured 534 g without batteries (a King is around 350 g), with 4 18650s, it’s 712 g.
4 XP-L Hi Leds are the distinctive trait of this light. They are enough centered, and the 4 reflectors are fused to each other, increasing the throw. The light has 2 electric switches next to each other, near the head. They protrude and are easily found. The flat tailcap with 3 holes for lanyard and a threated hole for a standard camera stand. 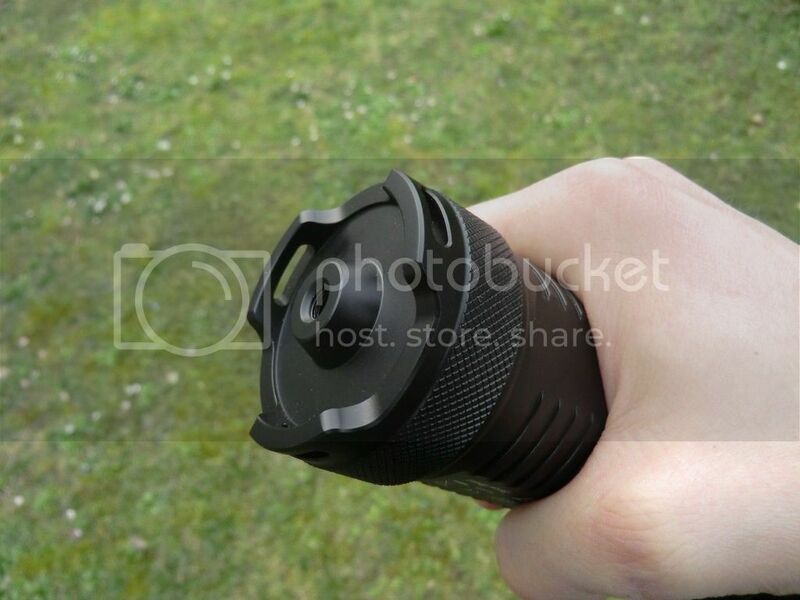 The long threads at the tailcap are anodized, and to physical lockout the light you need to untwist the tailcap almost to the end. This is due to the inner construction of the battery compartment. 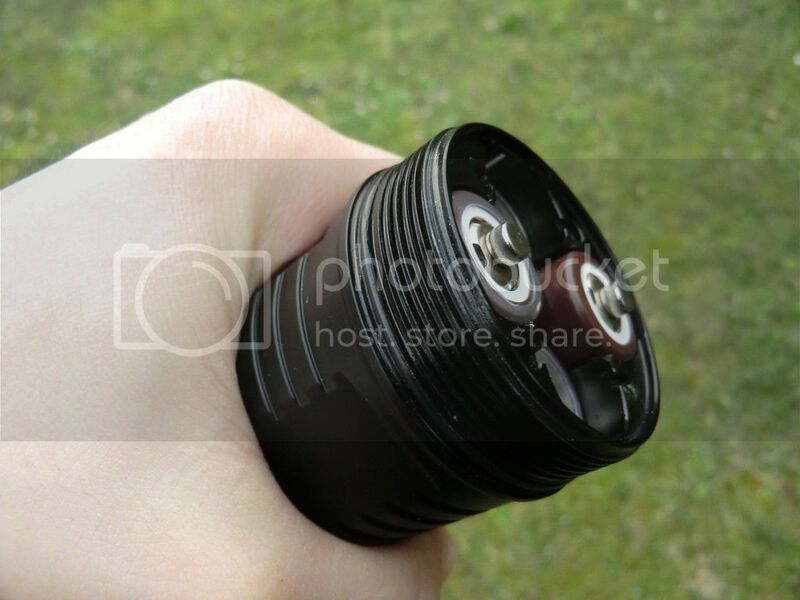 To screw the tailcap on the light you need to match the 2 protruding cilinders to the 2 bigger holes in the battery compartment, and then twist it as usual. Contact points and spring are gold plated. The light has a mechanical protection against polarity reversion. So the 18650 with flat top won’t work. I added some magnets on my flat top and they work fine thanks to the inner section of the tailcap that stays in place and doesn’t rotate when you twist the tailcap. The positive poles at the tailcap are protruding, so a flat top cell will work. The positive poles at the head are not protruding and are mechanically protected against polarity reversion. For practical uses I attached the magnets to all the cells, even if the 2 with the plus pole to the head really requires it. 1) the magnet get stuck to the driver or to the plus pole of the light. 2) the magnet will move and detach from the battery when twisting the pieces of the light. 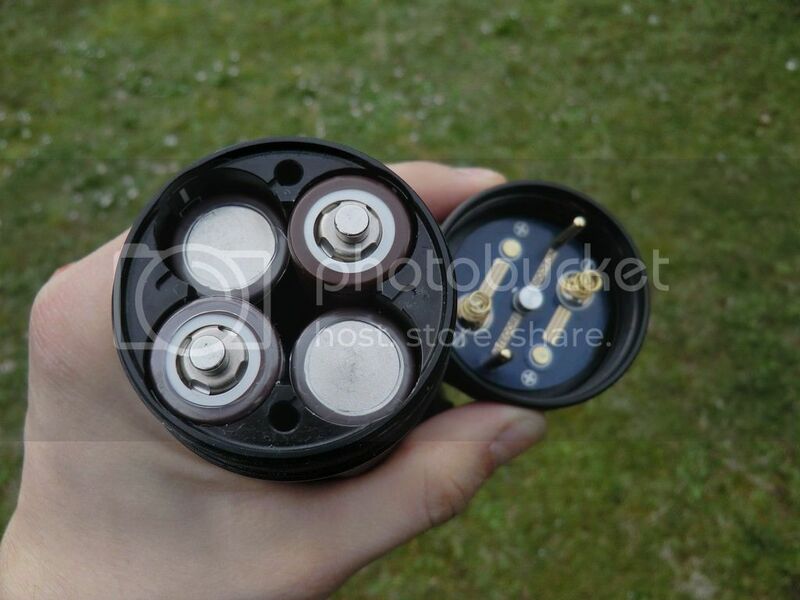 There’s neither problem on the TM16GT: the plus poles doesn’t attract the magnet, that always stay connected to the battery; and the batteries don’t move when twisting the pieces. I made a video of the UI, to explain it better. I measured at 2 meters and converted the data, obtaining 269’000 lux/m with 4 fully charged LG HG2. The turbo mode, L5, if uninterruptly run, is semi regulated. The test at turbo mode was made cooling the light with a fan. The high mode, L4, has a good regulation: flat for almost 3 hours then it gradually decreases. Mid level, L3, shows a similar pattern. I got longer runtimes compared to the Nitecore’s data, even if I used batteries with lower capacity. I didn’t test the runtime at L1 and L2. 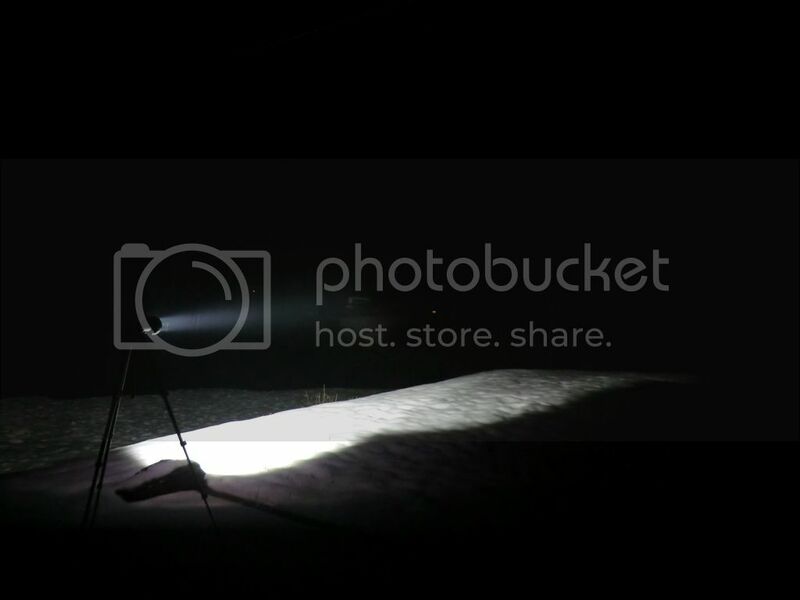 Beamshot I thank P.P. for lending me the setup. As you can see from the pics, i took the beamshot at 4°, with snow and rain. The TM16GT worked fine, but the wather made the pic worst than usual. The TM16GT has a great lumen/throw ratio compared to its weight and size. The trait that makes this light really interesting is the wide and intense spill, that is around a really intense and throwy spot. 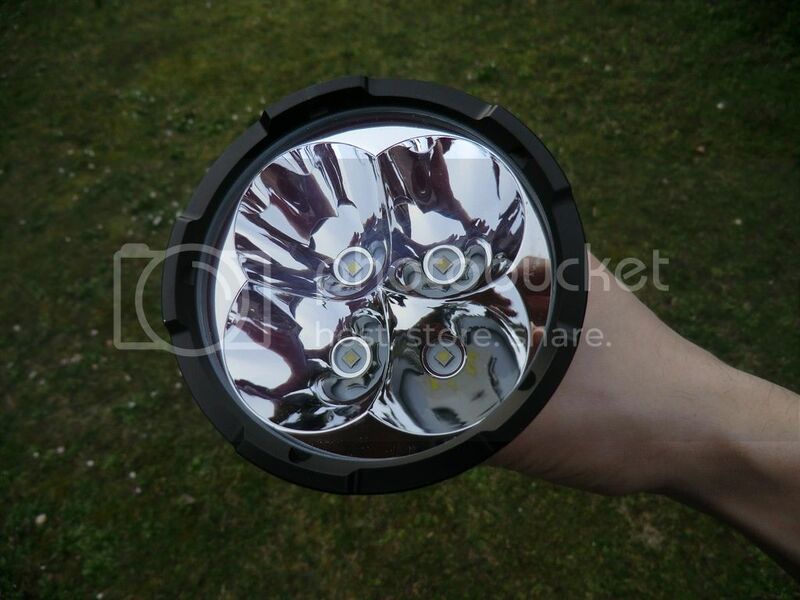 The XP-L Hi leds, with the fused reflectors make a wide and strong spill, typical of the multi XM-L Lights, and the great throw of the XP-L Hi lights. The spill is not circular, it shows some “petals” due to the reflector. However, in real use (in the woods, not pointing at the wall at 1 meter), it is still great. However, the light is not ideally usable at close distances, because of it’s intense spot. 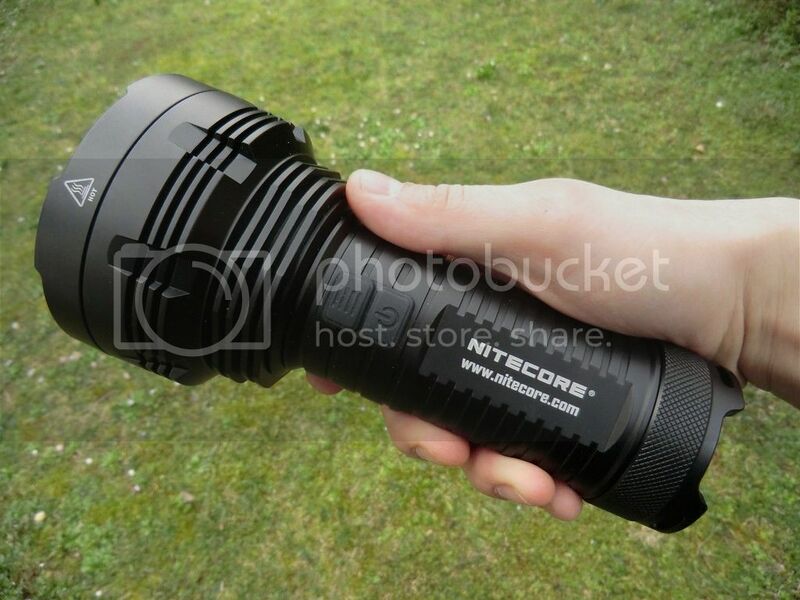 I like the 2 separate switches, better than the single switch with 2 stages, present on other Nitecore lights, as the MH20. The levels are well spaced, and in the outdoors I enjoyed greatly the 1500 and 500 lumens levels. Regulation of the High level could be better. The absence of battery carrier is a big plus for me: it decreased weight and size, and makes easier change the batteries. The thread for the stand works, I used to take some beamshots. 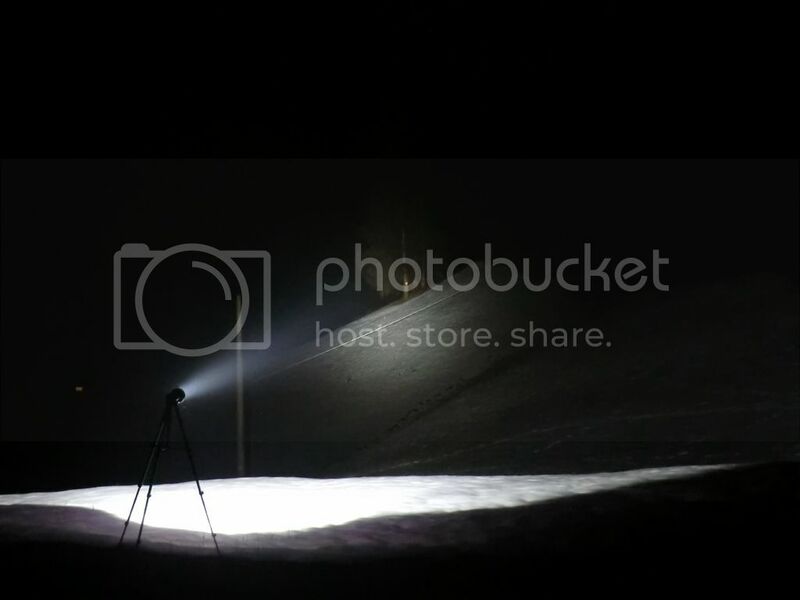 I would have preferred if it was on the body of the light, to more easily place it horizontally on the stand. 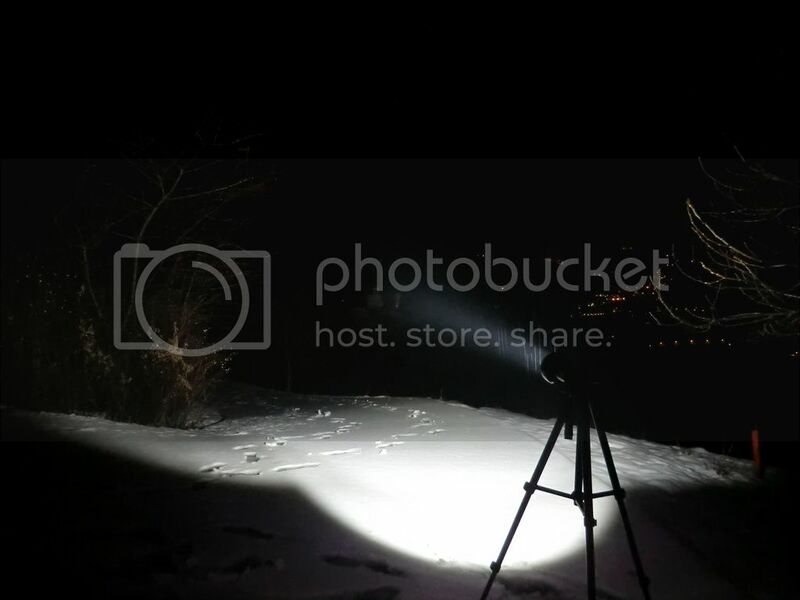 I find the TM16GT a great multi purpose light, for people who needs throw and spill, and a lot of lumens and good runtime at 1500 and 500 lumens. Take a look again at this pic: keeping the light higher than usual from the ground, the light of the spill will reach the feet of the stand. This means that in real use, the TM16GT will llighten starting from the feet of the user. Based on my experience, this feature is not so common as you can think, neither in the flood lights segment. I encourage you to do the same in complete darkness. Often the spill will start to enlight the ground starting from 20-50 cm, even at 1 meters in some lights. Walking in the woods, in outdoor with the area around your feet in the darkness, means exposing yourself to misstep and falling. 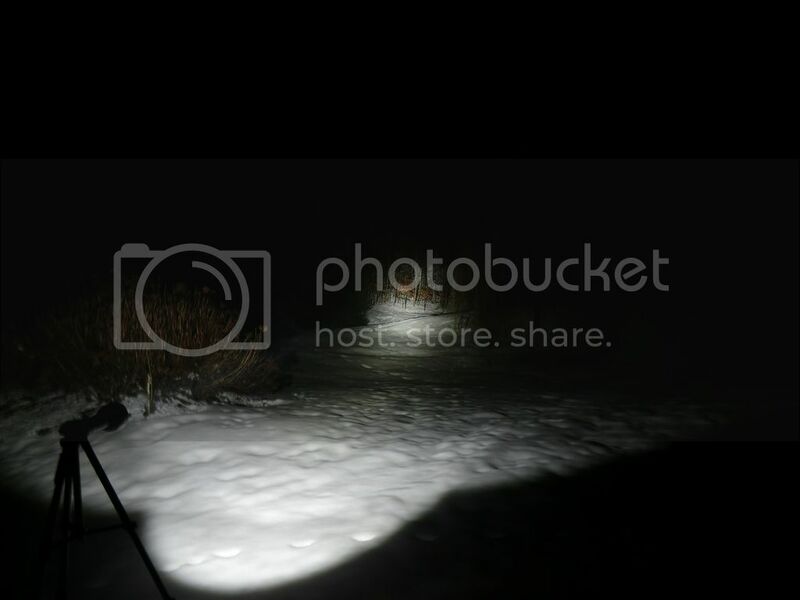 If I plan to hike with a throw light, usually means that I’ll have to bring another light, more flood (usually a headlamp) that will bring light near my feet. 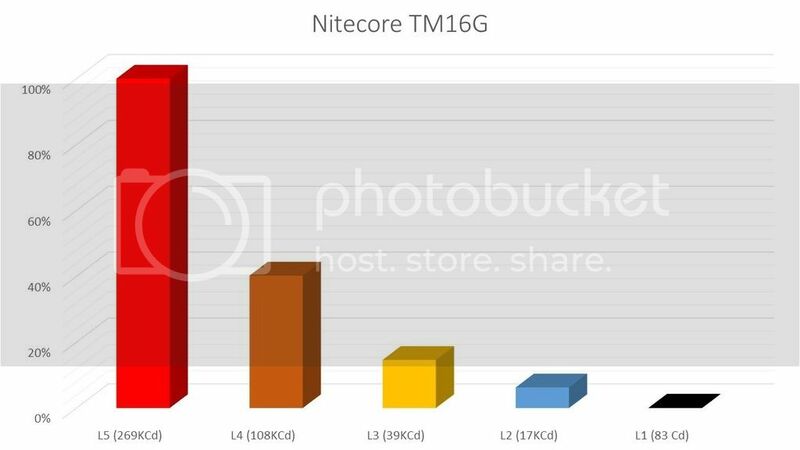 This is not the case of the Nitecore TM16GT, and this is why I can really say that is a multipurpose light. 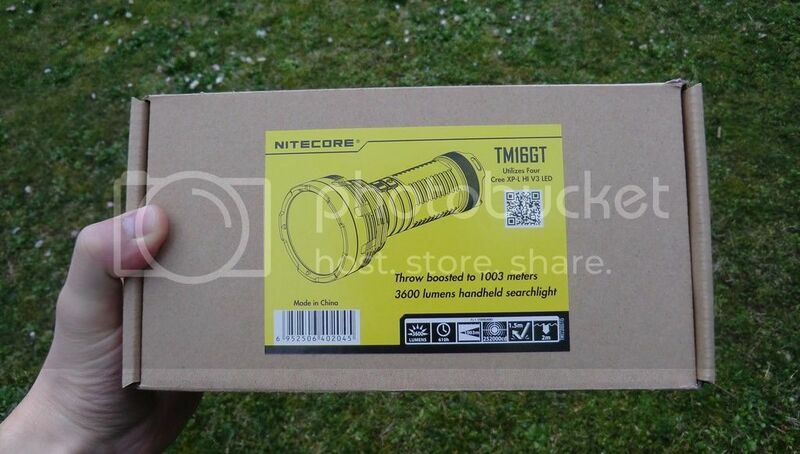 I received the ligth from Nitecore for the review. Beamshot and other test will follow. Thanks for reading. Like the tail that screws onto a tripod. Heck of a beam and indeed very broad spill. Wow, am i correct this thing costs ~$220? The same as 4 Thorfire S70s? In that case, I would get a S50 or S70 for throw and a small clip on light like the VG10 for my feet. 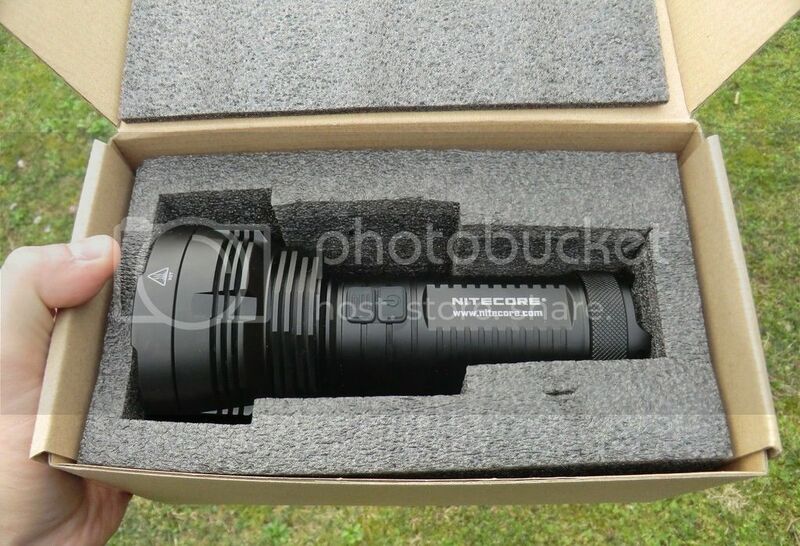 Hey I alreadty have that so this is a pass, no matter how impressive both flashlight and light it produces look. Hello, from what I hear there are some groupbuys that will save you A LOT of money. Just ask for the discounted price, and you’ll get one. Believe me. Very nice light. Powerful but not too heavy. Does get a little hot on Turbo mode but self manages the heat. Since I wasn’t satisfied with the result I got from the turbo runtime test, I made other tests, new test with LG HG2. I used 4 LG HG2 fully charged, and turned on the light for 60’, then I turned it off for 60’. I repeted this for some times. Then, I charged the same batteries again and left the light on, without cooling or pause. Apologize for the errors in the mesurement: the variations you can see in the blue series are due to the movement of objects near the luxmeters or the fact that the mesurement was taken from the instrument while I was turning on the light, so the sensor was “ramping” up. Still, you can clearly see the difference between the 2 curves. There is definetly a mechanism that regulates the output:temperature ratio. I added the linear curves of each series, because I found them rather interesting. I plan to do more test mixing cooling and pause, to see what’s the best combination for the regulation. Well done review. Thanks for posting. “We can easily forgive a child who is afraid of the dark; the real tragedy of life is when men are afraid of the light. I found it at $179.00.Do you think it is a good price? Great review. I adore this light. Hello, from what I hear there are some groupbuys that will save you A LOT of money. Just ask for the discounted price, and you’ll get one. Believe me. See if you can drop M4DM4X a PM to better that price. I can wait of course,as Martin is recovering,but also there is a holiday in China till 8th I think. 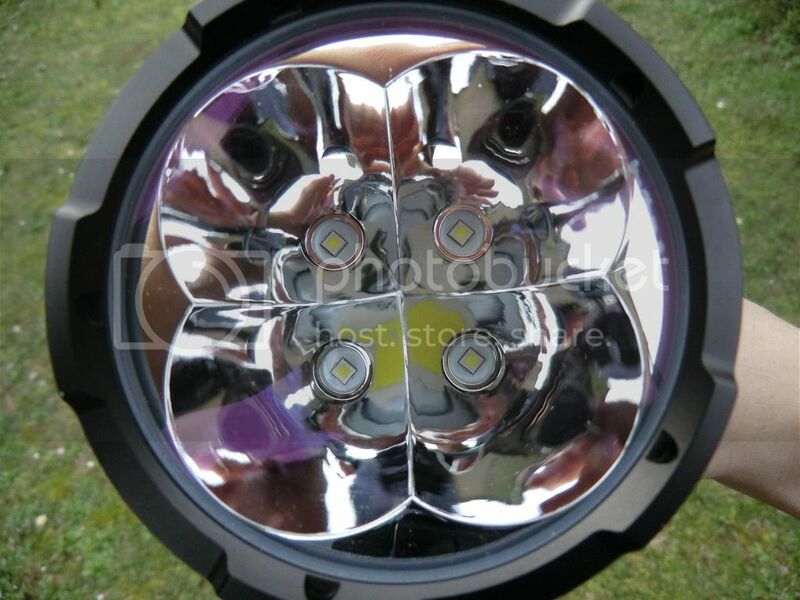 I have read yesterday that a guy here in Greece dedomed the leds of a Fenix TK75, 2015 edition,so it has 313000cd now.Having ordered the 16GT,which is now in the Athens airport and I will receive it in a couple of days,I ask if you believe that this 16GT,is possible to be modded for better throw. Because,you know,that I bought this over the Fenix,because of the better throw,and now I see the dedomed Fenix is better in this field. I have a K70 for thrower,but I would like to boost this also,if it is possible. Who knows. the TM16GT already has dedomed emitters, so maybe you could benefit using other dedomed emitters, like XP-G2. I know that the baseplate of the TM16GT has a proprietary format made to maximize heat dissipation, and is compatible with XP format only. I received the light yesterday,put four 30Qs,two of which are original button top,and the other two,are semi button top,as they have a raised top,but not exactly protruded as usual. I have a problem to screw the tail cap,but only when there are batteries in,while it is very easy,when there are not. Does someone face the same problem please? And something about the intensity.I measured it at two distances,4.8m and 6.8m and the result is identical.Only 220000cd.Batteries are those 30Qs full charged by a LiitoKala 500. I just pulled my flashlight out to use it after being stored for a few months and noticed the batterris needed charged so I threw them on the Opus and 2 batteries were at 4.1v and the other 2 batteries were at like 3.8v, strange. Anyone else notice this? I did have it set in locate mode or whatever it’s called was curious to see how long they would last with the blue leds flashing intermittently, do the blue lights on the buttons draw power from only 2 batteries or something? Would that even be possible? Probably not. Any ideas? I unscrew the tail cap till I don’t see the blue blinking anymore.So,there is not any current drain. Sounds like Nitecore’s “patented” parasitic drain feature just like in the TM06S*, only not so bad. But in just 2 of the 4 batterries? That’s the confusing part. The fact they continue to release products with parasitic drain is disheartening. The small $30 TIP had it also but in that case they listened to customers and fixed the issue. Thanks for the explanation. But hold on, this was the case with the TM06 (not sure about the TM06S though) as well right, with the rear clicky switch; only two cells would loose juice. But if the light uses 4S from the batteries, doesn’t this simply mean that you are using differently charged cells which we should avoid at all times? So isn’t this a really bad design? But if the light uses 4S from the batteries, doesn’t this simply mean that you are using differently charged cells which we should avoid at all times? So isn’t this a really bad design? That is correct, but there are ways to work around it. Obviously the first option is to physically lockout the light by partially unscrewing the tail cap. Another option, the one I use, is to rotate the pairs of 186550s to even out the effects of the parasitic drain. I also don’t let the cells drain below 4.0v before I swap them. By doing this I keep the load closer to even on all the cells, and they all recharge the same amount. Tacky, but it helps. 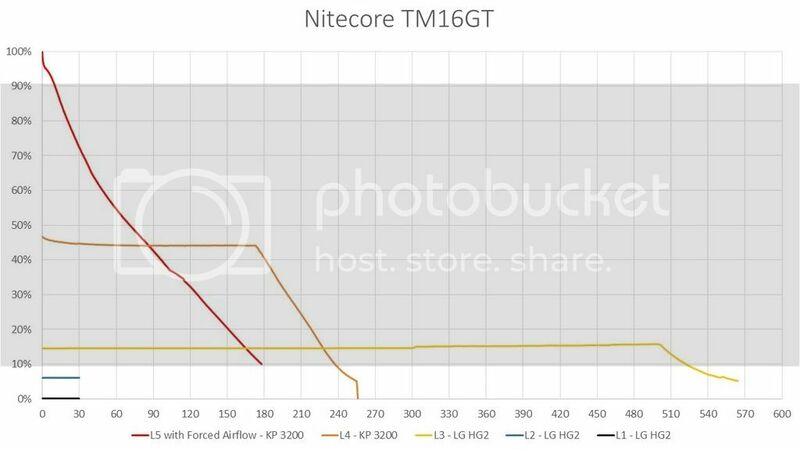 I too wonder what the deal is with Nitecore and parasitic drain. Some of their lights the drain is so low that for all intents and purposes it is not there. I have some Tubes that I got when they first shipped, and they still have a charge and light up just fine. Then my EA11 kills its 14500 after only a couple of months of lockout. Looks like the have the new designers working on the drivers, without supervision. You don't really need a parachute to skydive. But you DO need one if you want to skydive twice! 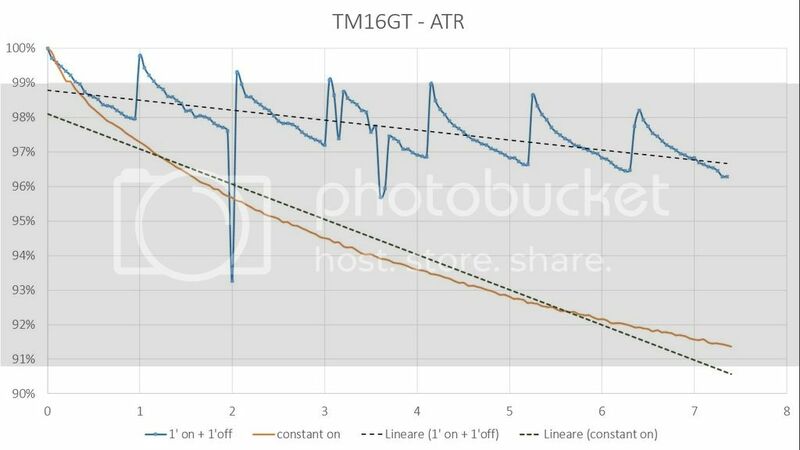 TM16GT – Yep that makes sense, explains why battery 2 and 3 were drained. I won’t be leaving it in that mode again it was just for testing purposes. Has anybody bypassed the springs of this light?I ask,because if the result of this is positive,I could send my TM16GT to a friend to do it. 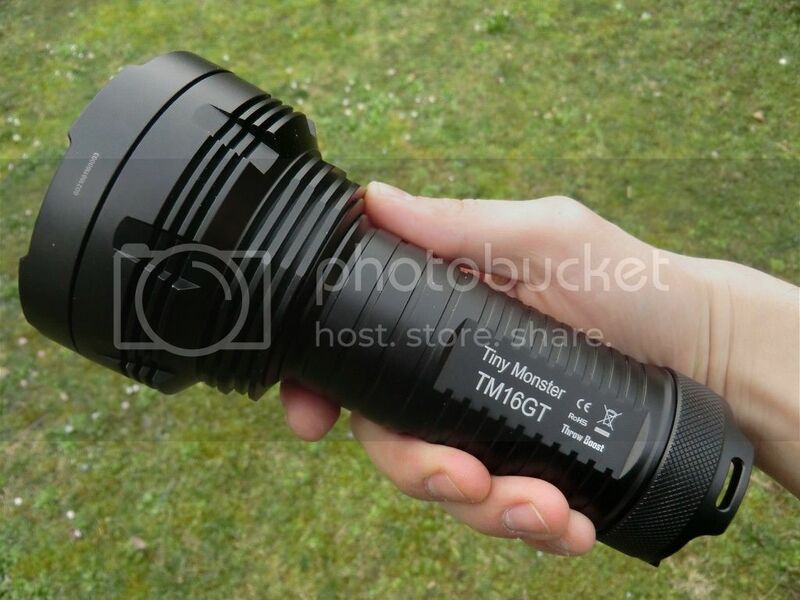 The TM16 can be modded easily enough, far and away besting a great many other modded lights. I put XHP-35’s in mine, it’s nearly double the lumens and awesomely bright. I love the form factor of the TM16, fits in the hand so well and yet is still a Monster of a light. Nice review, all the graphs and charts make it look so professional. 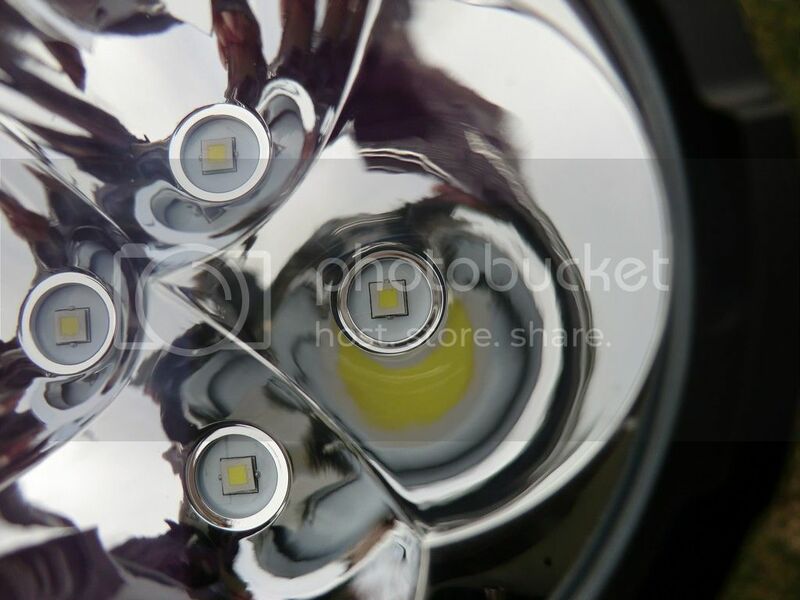 And what about the driver,have you made this yourself,or not?And the reflector,is it OK for the new leds? If it is possible for a friend here in Greece to make this conversion ,I could send the light to him for this. Are there any tips/guides as to what mods can be done relatively easily on the TM16GT? Stock driver, with a bit of resistor bump. 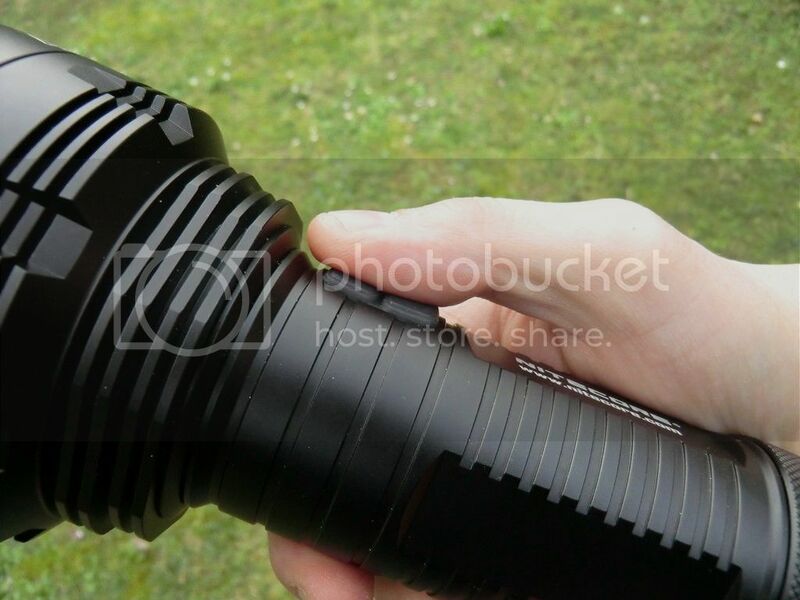 The XHP-35 is a 12V emitter but the same size as an XP-L so they do fit the reflector fine. I used copper direct thermal path mcpcb’s fitted to the emitter shelf. I am looking for my notes on this one (cleaned out my desk last month, can’t find anything!) but I believe it’s now making over 7000 lumens. Is the light glued Dale?